2009 is the Scottish Year of Homecoming to commemorate the 250th anniversary of the birth of poet, philosopher and philanderer Robert Burns. This week has seen a more contemporary homecoming with Franz Ferdinand playing a series of sell out shows at the famous Glasgow Barrowland. Our man Ian in Edinburgh was there and shares his thoughts from the evening. Fair play to the Franz, given they can command a headlining festival slot at the drop of a hat, it would have been easy to have done two nights at the arena sized SECC however the band chose instead to take the extra time to play shows at the most energetic and engaging venue which is every bodies favourite. Wednesday night was no exception to this as the room crackled with anticipation the minute the doors opened and by 9pm the crowd had reached a state of fever pitch. Now I think Franz Ferdinand have it just about perfect - a broad church of musical references - everything from German disco to comparisons to early Postcard favourites The Fire Engines (yes FF score the bonus point for their part in the reunion of The Fire Engines in 2005) and an ability to race along the tightrope of populist beats with enough innovation to keep the more seasoned fan ( ie old git like me) interested. The previous occasion I had seen the band was at an Edinburgh Festival show in Princes Street Gardens which felt sanitised and distant - an antithesis of everything that Glasgow Barrowland has to offer. 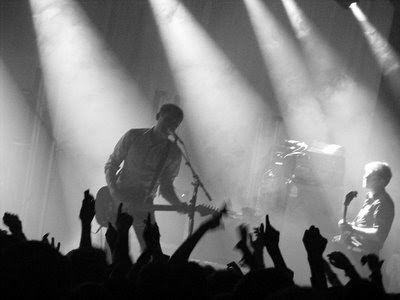 The second song, new single 'No You Girls' received the sort of reception of an old classic which was merited given the quality of the mix and Kapranos' bitter sweet , suggestive and pleading lyrics. Other tracks from Tonight were also enhanced by live performance with 'Twighlight Omens' coming across stronger than on the record. From there, the band guided us through a personal favourite 'Walk Away' which always remind me slightly of other Scottish giants Big Country. In their stride the energy of the band was being matched by a youthful and exuberant audience and the usual Franz high spots of 'Take Me Out' , 'Matinee' and 'Do You Want To' were greeted with expected adulation from a home crowd. I was impressed however that Kapranos played it straight and resisted a temptation where many performers fall foul, reminding the Barras audience that they are the best in the business. Aside from this, an advantage of a multi night run is that the sound engineers get a fighting chance of producing a sound which is worthy of the music and this was as close to perfect as I've heard recently. During tracks like '40' and 'Michael' from the debut LP, McCrathy produced guitar licks worthy of Nile Rogers whilst strutting like Angus Young. If he had been around in a different era, positive comparisons would have been made with jaggy guitar post punk legends The Gang Of Four or personal favourites Big Flame. The addition of keyboards on some tracks and at one stage a bit of impromptu mixing by Kapranos shows that the Ferdinand are still pushing their creative edge and despite the time taken to deliver the third album, there still appears a freshness and a confidence that they can stay at the top of their game for some time to come. Indeed with songs from the new album sounding strong live, particularly album opener 'Ulysses', they now have more weapons in the armoury to allow for further creative diversions. That coupled with a desire to play live shows in venues of all shapes and sizes will keep them fresh and on the radar for a long time to come.... pity it didn't happen to Big Flame as well.